Don't you just love spaghetti recipes. I especially love them because they are easy and quick to prepare. My husband is a very plain eater, really easy to prepare a meal for. The tiny serving of sauce is his trademark. The skimpier the better. He loves it when, after being out of the house for a day and we return home early in the evening and we are hungry. Here is a fast and simple recipe without any fanfare. Place the meatballs in a dish with a tablespoon of water and place in the microwave for one minute. In the frying pan place the warmed up meatballs and brown them for a couple of minutes. Mix in the tomato sauce and paste and the onion. Boil the spaghetti for 10 minutes and drain. 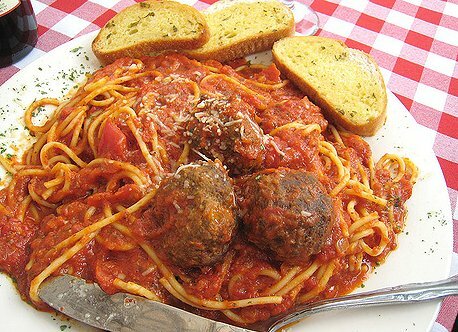 When it is ready, place the spaghetti on the plates, place the meatballs on top and spoon the sauce over the dish. This is the simplest form of food to prepare. It is a gourmets nightmare but for my husband and I it is a simple, very quick meal. Here is a nice spaghetti dish that can be prepared in a casserole. This recipe serves 6 to 8 people. If you have a large group it doubles easily. It also freezes well. In a frying pan, brown green pepper, mushrooms and meat. Boil spaghetti in salted water until tender, 15 minutes. Combine all the ingredients in large casserole: mix well. Bake in moderate 325F oven for 45 minutes. Serve and enjoy. This is a great looking and tasting pasta recipe everyone will enjoy. Our family loves these spaghetti recipes. 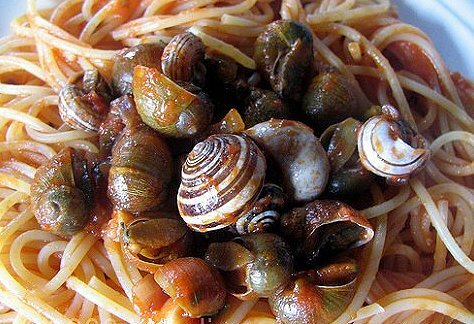 Sautéed snails are bow-tied with strips of blanched green onion, stuffed into pasta shells, then baked in a flavored sauce. Deft handwork makes this creative recipe look special. For these spaghetti recipes, blanche the green tops of onions by immersing in boiling water for 1 minute and then plunging immediately into cold water. Cut blanched onion into long strips; set aside. Drain snails; sauté in peanut oil for 5 seconds. Drain. Carefully tie the long strips of green onion in a bow tie around each snail. Sauce: Heat butter. Add spices. Cook gently for 2 minutes without browning. Add remaining ingredients; bring to a boil. Stuff shells with bow-tied escargots; place in baking dish. Pour sauce over all. Bake at 450F for 15 minutes. Serves 6 to 8. This is one of my favorite spaghetti recipes.